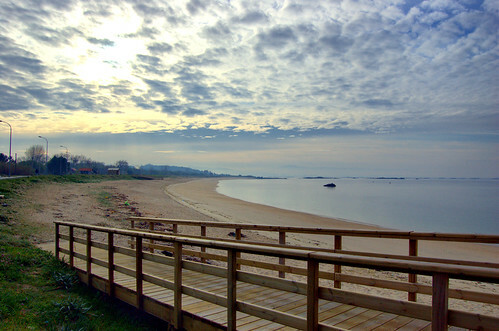 I’m Going to Galicia Next Year! I know I’ve already tweeted about it twice now, but I would like to officially announce on this blog that I will be a North American Language and Culture Assistant at an elementary school in the town of Boiro, Galicia, for the 2013-2014 school year. 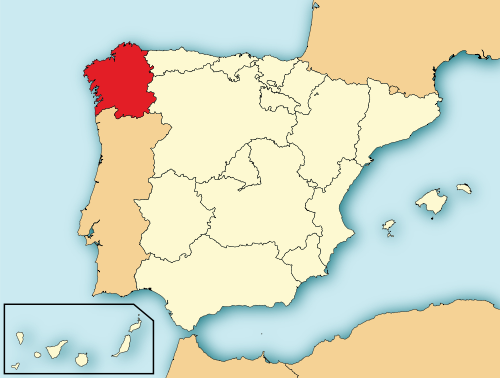 Galicia is a little-visited region of Spain in the northwest corner of the country, just to the north of Portugal. The language they speak there is very closely related to Portuguese, although everyone speaks Spanish as well. Like the Pacific Northwest of the U.S., Galicia is green, lush, and rainy—and it’s the last adjective that everyone here down south always uses to describe the place, even though it’s been really rainy here, too! Famous for its seafood, the region is well-known to the rest of Spain for pulpo a la gallega (Galician-style octopus) and mejillones en escabeche (canned marinated mussels). Perhaps infamously, the naval town of Ferrol is the birthplace of dictator Francisco Franco. Finally, the Camino de Santiago (“Way of St. James”)—the ancient pilgrimage route running across northern Spain—ends in the regional capital of Santiago de Compostela, attracting hundreds of thousands of tourists pilgrims every year. Even though this year in Jaén province has been wonderful, I’m really excited to be moving to the complete opposite side of the country, where I’ll be closer to places like León, Salamanca, and Asturias. There is just so much to see and do in Spain, but to get to places like Cantabria or Castilla from Andalucía would involve an entire day of transit. Hopefully Galicia will be a strategic location for such travels. Also, Portugal’s right next door! Anyway, my school is technically in a village called Abanqueiro, but it belongs to the municipality of Boiro, where the town hall is. Both places are lightly populated but also on the coast, and play a big role in catching mussels and/or canning them in escabeche, an acidic, paprika-based liquid marinade. Like last year, I was initially a little disappointed with my placement because it’s another elementary school in a rural pueblo. However, after some Google Map-ing, I realized Abanqueiro and Boiro are around an hour’s drive (50-60km) from the capital, Santiago de Compostela, where I would love to live for a year if possible. One of my friends who’s living in the provincial capital of Lugo this year told me that many, many teachers live there and commute to the tiny town where her school is, 70km away. If her experience in Galicia is any indication, there should be at least a few teachers who live in Santiago and drive to and from school each day that I could hitch rides with. Santiago itself isn’t a big town but it is the regional capital with ~100,000 people, a World Heritage-listed old town, a university, a Walmart-style Carrefour store, a high-speed train station, and an international airport—all of which would be a nice upgrade from my beloved Úbeda where I’m living right now. I’m really looking forward to next year and the adventures it will bring living in a new city, working at a new school, and (possibly) learning a new language. I’m not looking forward to the 6- to 9-hour train ride from Madrid, or the infamous rain. But a year in Galicia will give me another perspective on what “teepeecal espanees” can mean outside of Andalucía.